In model railroading and in life I’ve found the following quote, by Sun Tzu, to be eminently true: “No plan survives contact with the enemy”. In fact despite being around before the invention of railways and railway modelling I am pretty certain that old Mr Tzu was a layout builder and pre railway modeller himself. To date I’ve worked through several different designs before arriving on the layout design that we’ll hereinafter refer to as the The Mk I Design shown below in Image 1. Distance between the industries requiring a run for the locomotives and cars alike. The interchange being double tracked and taking up space. I put this design out for comment on a couple of groups and Chris Gilbert (layout designer and builder extraordinaire) made a couple of suggestions that would have made the layout better. They involved using a 60 degree crossing off the main to get the interchange tracks isolated from the transload and the loco spurs. Unfortunately at the moment I cannot afford to buy another code 83 crossing or switch as I’ve used up my modelling allowance for the moment. In the meantime, I’ve tried to see if I could work around those issues and attempt to improve the basic design. Thus we arrive at the Mk II design shown below in Image 2. 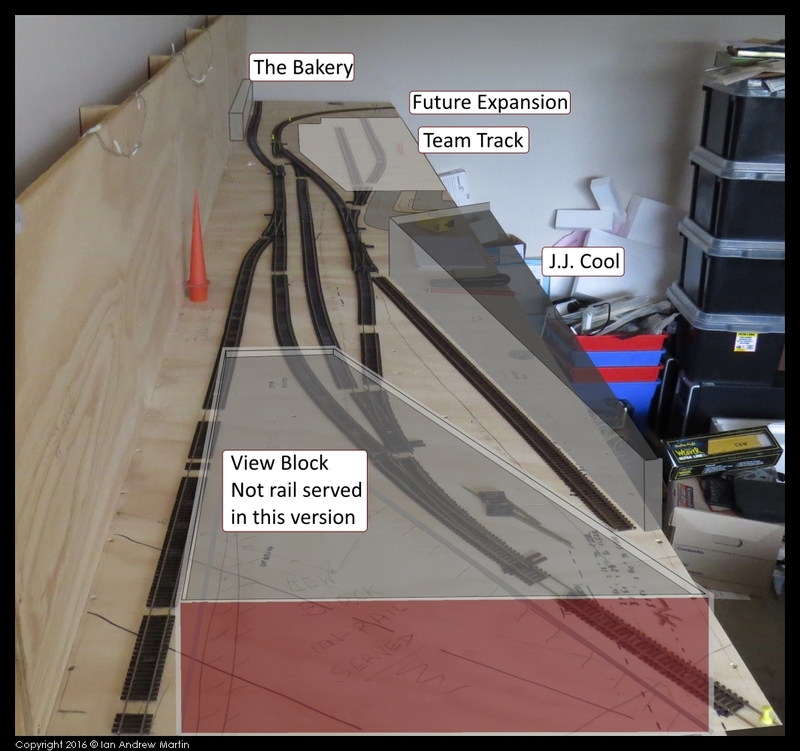 Moving the far main line further toward the rear of the board and giving the loco rebuilder/maintenance facility more visual space at the front of the layout. While more time than I expected has passed since last I wrote, the reworking of ideas has not stopped and we now appear to be at the Mk LXXII (that’s 72 for those of you who never got Roman numerals) version of the layout design. After the last update on this page, I spent some time reviewing what I wanted to do with the layout in the longer term. Among those is to extend it as time, space and funds allow. 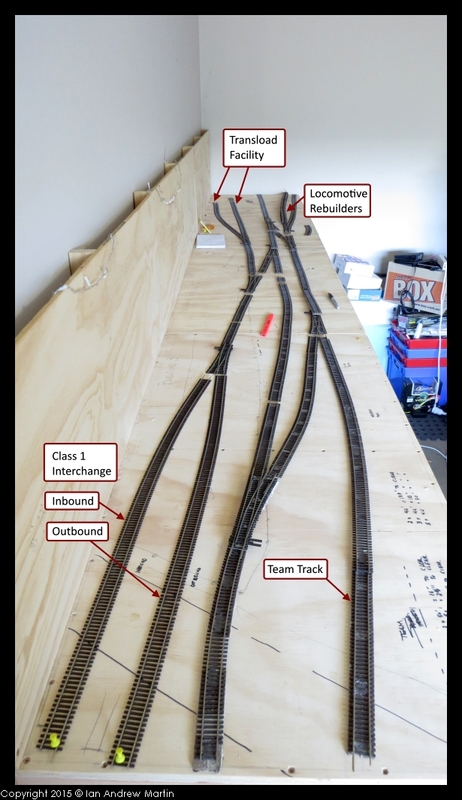 In order to do that I’ve had to limit the length of the layout (it’s 12 foot or 3600mm) to make sure that it can fit in a standard sized room somewhere down the track. Most room sizes have at least one wall at 12 feet in length; thus the layout was designed to be no longer than that to allow it to fit against one wall. A lead for expansion should I so choose in the future (I have two more boards already built, just waiting on the time to run the tops on the Men’s shed table saw to rip them to width). 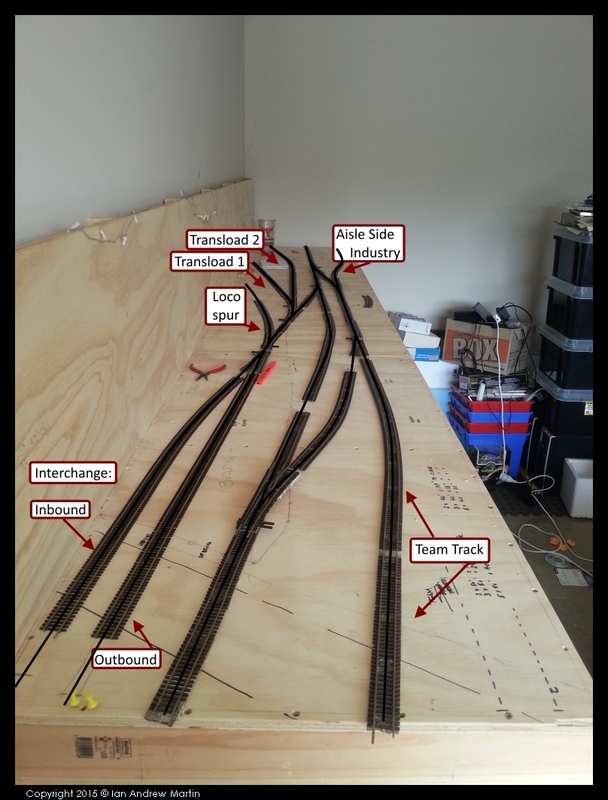 While playing with the basic track plan yesterday I extended the interchange track to allow for up to 7 x 50 foot cars. That is likely more than enough for a short operating session, the only kind I want with the layout in its current and expected form. Looking into the future is something that I do regularly. I don’t necessarily see much there but peeking forward at least provides ideas for opportunity and advancement of the layout. Should the longer term prospects become better and we have a larger space to put the layout into then I’d rework the interchange and use that track for another long industry. The rest I’d leave as they stand for the moment. I’m pleased with where I’ve arrived overall. This has been a long project, and one that has taken longer in the planning than I thought. Perhaps that was a case of too many options and too little constraint. Either way I have come back to a layout similar in scope to what I had designed originally, without the inherent faults in that first design when I aimed to high, and reached too far. You can see the original design in the post Why I chose not to design my layout – Part 3. This layout has the best of the features I wanted without the overreach and any obvious faults (I’m sure that they are there, but I’ll leave that to you to help me find. Each operating session will be limited in the amount of time and car numbers. The layout will be more empty track and fewer cars, in keeping with many of the prototypes that I enjoy – industrial parks and other switching areas. In addition I want to be able to get 3-5 operating sessions in per week. So from a realism point of view this rings true in my mind as the other designs came close to but never achieved. My shortline does not want to have to pay for demurrage while cars are sitting in sidings somewhere when we can have cars in and out in the shortest time possible (24 hours) and keep the costs down. So – the Mark 72 edition of the new layout is here; open to public scrutiny. Let me know your thoughts, and share them on the blog. Where do we go from here? Next time I’ll be doing an operations review and getting an idea of how the industries will work. Then we’ll get into the real putting together of the layout. Enjoy, and talk to you soon.